Chickens, its time to talk about wine. I’m not talking about that casual after-work grab whatever bottle is in the fridge left from the weekend and glug it into the nearest vessel for some decompression. I’m not talking about that bottle you picked for the clever cutesy name on the label that you take to “book club” because you presume it will go well with salsa and Tostitos and girl talk. Today we are talking about wine. Serious wine. Wine you choose as much for what it will be in 5 or 10 or 25 years as for what it is today. Wine you choose because it is the best possible pairing for the meal you are preparing. Wine that is a passion, a pleasure, a way to connect as much as a way to relax. Wine with a capital W, where the winemaker knows that the wine is made in the vineyard and not the winery, and the name of the importer is as important as the name of the grape. I may have mentioned before, that my Charming Suitor is a wine guy. A serious wine guy. A collector for over 30 years. You know how when you marry someone, you also marry their family and friends? In my case, that family includes some names like Donnhoff and Zind-Humbrecht and Comte LaFon, and the friends include pinot noir, nebbiolo, mourvedre, and riesling. Here is what I learned when I met CS. It isn’t the grape, it is the producer. And the terroir, like territory, the expression of the land on which the grapes are grown developed in the barrel. You should be able to taste the geography in the glass. I thought I didn’t like Chardonnay, finding it like licking an oak tree covered in butter. Turns out I don’t like oaky California Chardonnay, what I like is Chardonnay from Burgundy which is much more like licking lime juice off a river rock, or unoaked Chardonnay from New Zealand which is like eating fresh melon with a squirt of lemon and a drizzle of honey. I thought I hated Riesling, waving it off as cloyingly sweet, and always suspect in the weird blue bottles. CS took me to the best wine store in Chicago, Howard’s Wine Cellar on Belmont, and put a 20-year-old Riesling from the Mosel in my face. I swooned. Turns out? Riesling is the single greatest white grape, and in the hands of a decent producer, one the best possible things to drink with great food. You think you need red wine with lamb? You’ve never tasted it with Riesling. Thai food? Riesling. Trust me, good Riesling isn’t sweet, it isn’t cloying and it is freaking delicious. Since he has been at this for so long, he has amassed something of a large collection. You know, enough wine so that we can drink very well. For the rest of our natural lives. Even if we open a restaurant in our living room. And he has, for all of this time, been storing it in a special wine storage facility. About 4 miles from our house. Which is, as you might imagine, somewhat inconvenient. For our first anniversary I bought him a 160 bottle wine fridge so that he could keep a decent stash in the house and not have to drive to the storage facility every time we needed wine. We did a ton of research, and after reading every possible article and review, found that Vinotemp was the company to go with. Founded by a winemaker who was looking for better and smarter ways to store wine at home, the Vinotemp units have the dual temp system that you need for storing red, white and champagne in the same unit, humidity control, and they run quiet and with energy efficiency. Plus they have a lock on them, in case you are worried about bottles walking away, or finding themselves in the hands of the underaged. We set it up in the basement and it became the “house cellar”, allowing CS to rotate the wines from storage that were at their peak onsite where we could remember to drink them! Win/win! When we began designing our house, the first thing CS said was that whatever else we did, it wouldn’t be a real dream house unless he had a wine cellar. And when he dreams of a wine cellar, it isn’t some fancy room with grape vines painted on venetian plaster walls, with special bottles lit on display racks. Nope. He dreams of a wine cellar that looks a little dirty, a little dusty, a little musty. A cellar where he can organize his wines for easy access. He doesn’t need a tasting room, he doesn’t want to taste wine in a damp cold room, he wants to taste wine in our living room or dining room. The wine cellar just needs to store it properly. So when we again set out to do our research, it came as no surprise that when it comes to building a wine cellar from scratch? You guessed it. Vinotemp to the rescue. We sent them the dimensions of the space, the number of bottles and types of wines we were looking to store, a general layout of the basement. And they helped us figure out which cooling system to order, and advised us on every aspect of prepping the space properly. Since we were starting from scratch with a gutted space that needed no retrofitting, we were able to go with a very efficient ducted system. It essentially works like your central air-conditioning system, with ductwork feeding the space and a thermostat regulating the temperature but also the humidity. It is precisely calibrated so that you can keep the conditions in your cellar absolutely perfect at all times. Once we decided on the unit, Vinotemp began to build it. They put all of the cooling systems together custom, and then test them at the factory to be sure that what arrives is what you need and in tiptop working order. Ours arrives Wednesday. We have finished framing out the cellar space, and are in the process of installing vapor barrier and a tremendous amount of insulation, per their detailed specs. We are using special wood and drywall that is designed to be moisture and mold resistant. Once the space is built-out and painted, we will work with our Vinotemp designer to do the racking system. CS is still debating what sort of racking he wants, and they have many to choose from, so stay tuned and we will keep you posted on the design of the space as it comes together! 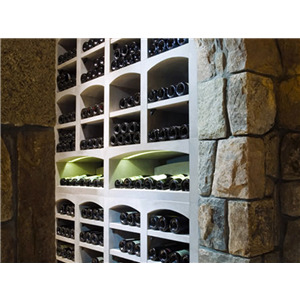 I love this stone racking, similar to the stuff they use in Burgundy cellars, and totally gorgeous! Even better, we are designing a space in the future butler’s pantry to move the Vinotemp wine fridge upstairs, where it will be a godsend for both our everyday drinking and for parties. Stay tuned for more cellar updates, along with some pictures of the progress! 1. We have a tendency in this country to drink white wines too cold and red wines too warm. Room temp is 70 degrees or more. Reds are best stored and drunk at 56 degrees. Whites at 54. General rule? Use the half-hour philosophy. Take whites and sparkling wines out of your fridge half an hour before you want to drink them, put red wines into your fridge half an hour before you want to drink them. And if you are ordering in a restaurant, ask to feel the bottle, especially for reds. If it isn't cool to the touch, ask for the bottle to be put on ice for five minutes. 2. Make friends with a competent wine seller. You don’t have to learn all there is to know about wine, you just have to know someone who does! Find a place that you like, and talk to the wine seller about what you enjoy about wine and what you don’t, what you want to eat with the wines you choose, and what price points you are comfortable with. Let them guide you to two or three bottles. Drink them. Did they nail it? Now you have your person. Did they fail? Find someone else. 3. Only buy what you can store properly until you want to drink it. I know you might like the look of a full wine rack, but if the only place to put it is in your kitchen next to the stove, leave it empty. Wine stored at room temp is already less than ideal, anywhere in the kitchen is just going to cook it. If you don’t have space or budget for a small wine fridge, at least store your wine in a dark cool place, basements are preferable, but out of the way closets are okay too, and don’t invest in a lot of bottles, just keep it to what you are likely to drink within the next few weeks. 4. Wines for food are not necessarily the same as wines for casual drinking on their own. Sometimes a wine that might not be terribly delicious for just sitting around having a bit of a relaxing time after work, but will be absolutely spectacular with food. For casual drinking, stick with things that are juicy and fruit forward like a young syrah, something refreshing like a rosé, or crisp and bright like a gruner veltliner. With appetizers, champagne or sparkling wine is always welcome, and there is a very affordable bubbly out of New Mexico called Gruet that you can keep on hand. For dinners, you can bring more complexity to the table, like a burgundy or Riesling, and if you can, maybe something with a little more bottle age on it. 5. If you have the ability, invest in a Vinotemp wine fridge. They have a range of sizes and styles, and a price for almost any budget. They even sell refurbished units at a fraction of the retail price, some of them as inexpensive as $120! Most importantly, once you have one, you’ll be able to store and serve wine whenever you like, and know that it will always be the perfect temperature and best possible condition. Did Someone Say Fried Chicken?